On 22 August 1982, the school manager of the Holy Faith School at Rabercon, New Ross, County Wexford wrote to a teacher, Eileen Flynn, terminating her position as from November 30 1982. Flynn was pregnant. Though she was in a long-term relationship she was unmarried, her partner already married in pre-divorce Ireland. The dismissal and a failed High Court challenge were major news stories. This was a time when right wing Catholic forces were trying and succeeding to stampede political leaders in the South into making abortion unconstitutional. While Flynn was unsuccessfully challenging her dismissal the state was gripped by definitions of the ‘unborn’ and on how best to prevent Irish women from controlling the contents of their bodies. Eileen Flynn’s predicament was the reality: if you were pregnant and unmarried in southern Ireland, you could, and in Eileen Flynn’s case did, lose your job. Tragically, Eileen Flynn died suddenly on September 9, leaving five children and her long time partner, Ritche Roche, behind. They had married after divorce became legal in 1995. After her death, her story was re-told in newspapers, on radio and on television. Rightly so, but not the whole story. One part was left untold. Flynn’s story was part of Ireland’s conversation with itself about personal and public morality. These stories are usually told to us in the first person. They turn public controversy into personal reality. Broadcasting is the ideal medium. 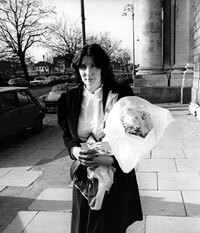 We never heard Eileen Flynn’s story on Irish radio and television. The reason, the state broadcaster, RTE, had preconceived ideas about the politics of Eileen Flynn’s pregnancy. Betty Purcell, a producer on RTE Radio One, did attempt to gain Flynn’s agreement to do an interview for Women Today. However, Purcell reported later, ‘there was a complication as far as RTE was concerned’. Ritchie Roche, Eileen Flynn’s partner, was a member of Sinn Féin. He was vice-chair of Wexford town’s Sinn Féin cumann. Purcell reported that she ‘was told by [her] line manager that [Flynn] would have to be asked whether she too was a member of Sinn Féin’. Purcell reported that Flynn, “was not inclined to do the interview, but I was convincing her, I felt. I took a deep breath and asked the question. There was a silence, and then she said: ‘Look, I think I’d rather not talk on radio’. That was that’”. It so happened that Flynn was not a member of Sinn Féin. Had Flynn been a member it would have been irrelevant. RTE’s practice was deemed in 1992 and 1993 in the High Court and the Supreme Court to be an illegal extension of state censorship of republicans under Section 31 of the Broadcasting Act. Larry O’Toole, now a Dublin Sinn Féin Councillor, then an elected member of the Bakery Workers Union Executive, successfully challenged RTE’s banning him while representing striking workers in Finglas. RTÉ began censoring itself after then broadcasting minister Conor Cruise O’Brien entered the station in October 1974. He wanted to oppose what he called a ‘spiritual’ occupation by the IRA. The programme that angered him was about the treatment of internees in the North of Ireland. Those responsible were disciplined by RTÉ management, the producer, Eoghan Harris, most severely. Previously, RTÉ management had stood by their staff. Not any more. After that, any and all absurdities gripped the mindset of RTE managers tasked with fighting republican demons. Flynn was a victim of these ghost busters, a victim of RTE’s war with itself. The real victims in the long run were the audience, denied real stories and denied the right to see Sinn Féin members and even their life partners as part and parcel of Irish society. Those who had no problem with that outcome also have no problem forgetting this part of Eileen Flynn’s story. That is significant. • Niall Meehan is researching the impact of political censorship. He would like to hear from those affected by political censorship, from those banned and those forced to do the banning.